Have you enjoyed extremely juicy ribs yet? And have you ever asked about that recipe? Chefs will most likely say its secret was in the meat marinating. Marinating process involves soaking foods in your preferred seasoning, or the chef’s secret seasoning before cooking them. The process enhances the flavor of foods and tenderizes our meats. This article will discuss the different kinds of marinade, which is the liquid seasoning where the meat is soaked. We will also talk about the benefits of marinating, especially with meat. Which food items do you marinate before cooking? How long does it take to marinate a food item thoroughly? 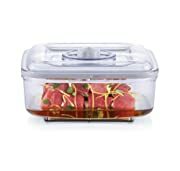 How to speed up meat marinating with FoodSaver marinating container and vacuum sealer? These questions and more will be discussed here. How Long To Marinate Food? What Items Do You Need To Speed Up Marinating? Why Using The Foodsaver System Help To Speed Up Marinating? How To Marinate Meat Quickly With FoodSaver? That is the liquid seasoning which flavors and tenderizes the meat. 2- Enzymatic marinade uses pineapple, papaya, yogurt or milk. This marinade turns food into mush. Either way, you also add oils, herbs, and spices to flavor the food to your preference. My favorite herbs and spices to make the seasoning are mint, dill weed, cilantro, onion, basil, parsley, pepper, and cinnamon. I also frequently use my ninja blender or combo of blender and food processor for chopping and mixing them. That is a fast and effective way. Don’t forget to adjust your marinade according to the food you are going to use. It is okay to use an acidic marinade on meat if it is a tight-textured cut of steak, like flank. Because of its texture, the acid will not seep down through the flesh, so it will not cause it to toughen. If you are marinating shrimp, use lesser acid. In that case, you can mix one part acid to four parts of oil. This will give a good texture to your shrimp. The general rule to have a perfect marinade is to combine 1 part acid with 3 parts oil and your seasoning. Acids can be wine, beer, vinegar or lemon juice. For the oil, you can choose from a selection of basil oil, sesame oil, virgin oil, mayonnaise or buttermilk. And the seasoning can be – according to your taste – fresh or dried herbs, garlic, ginger, onions or hot pepper flakes. Use acidic marinade for meat and fish, but don’t let it sit too long, and adjust the portion of the acid – the wine or vinegar – especially for the seafood. To make this marinade, use enzymes from bromelain, like pineapple, and papain in papaya. Use of this marinade is not as frequent as the acidic marinade. Mainly because if left too long, the enzymes can turn the meats into mush. Shrimp tastes great with an olive oil and lime juice combination. The marinating process is a science. Raw meat is tough because of the collagen and elastin fibers in the connective tissues. To tenderize meat, you can choose to apply moist heat, like braising and stewing, with the beef being submerged in hot water at low temperature but for an extended period. The other option to tenderize meat is to use acid or enzyme to break down its connective tissues, which toughen the meat. The marinating is a better option not only because it takes less work, but also because it adds flavor to our meat cuts. Using the right ingredients and the right proportion, it can tenderize your meat giving you a tender, juicy steak barbecue. Tenderized food is healthy because it requires lesser effort to digest the protein in the meat. Marinating locks in the moisture, so your food is not dry and remains juicy. It is full of flavor because marinating takes time, allowing the seasoning to seep into the food thoroughly. It is suitable for health. It minimizes cancer risks. One, because some fresh herbs are anti-oxidants. And second, the process of cooking on high heat, like grilling, can increase the carcinogenic HCA’s, but marinating reduces the risk by 99%. Using acidic marinade stops bacteria growth. It will slow down the process of spoilage, and you can keep the food longer. Marinated foods can be cooked in a variety of ways. The most common is to grill it, but it can also be roasted, boiled, fried or baked. The unique way is for sous vide cooking. There are some arguments against marinating foods, but the points can be rebutted. The bottom line of it is to use proper ingredients and correct methods for food safety. In a nutshell, the benefits still outweigh the possible risks. The fact that the marinating used is common in daily cooking everywhere. Get it right, and you can enjoy tender, juicy burger steaks or back ribs for dinner. Marinate the meat thawed. If you marinate frozen, the outer layer will turn mushy. After making the marinade and mixing it with the meat or food, place it in the refrigerator to prevent spoilage. Do not marinate at room temperature. Or instead, make a different marinade to be placed on the table as a sauce. It is safest to marinate in a glass container as acid does not react to the glass. You can also use food-grade plastic containers. Other kinds of material can react with acid and would not be safe when ingested. Save the used marinade for future use by storing it in the refrigerator. Don’t forget to label! If you are using the same marinade for chicken and another kind of meat, it is best to use separate containers for each. Make enough marinade to submerge your meat or fish. You can make indentations in your meat to allow absorption of the marinade. This can be a trick question. As earlier stated, acidic marinade may toughen up meat, while enzymatic marinade may render it mush. General rule: in the shortest, 30 minutes is needed for flavors to seep in. Any time shorter than that means the flavors will only be on the surface, and not deep down in the meat. Lamb – minimum of 3 hours, maximum of 24 hours. How to speed up marinating? How to marinate meat quickly? How to marinate meat fast? Yes, technology is our choice; there is the quickest way to marinade and still get the best results that are to use a good vacuum sealer and its accessories. Ever had that craving for a juicy steak but you can’t wait too long to get it marinated and cooked? Repeating the vacuum process in the Quick Marinator 2 to 3 times works best because the air and some liquid are removed from the meat during vacuum, and on the release, the marinade moves in a rush into the meat > marinade being more infused into the food. You can go ahead cook the meat, or transfer it to a different container for refrigeration. Pour the marinade into the meat. Vacuum until bubbles stop. A glass marinator would be the best container to use for the quick marinating. However, there is another option if you don’t have one: plastic bags. Just remember though that it has to be BPA-free to make it safe to use considering the acid content of your marinade. No problem with the liquid marinade Countertop vacuum sealers cannot efficiently vacuum seal liquids. Chamber vacuum sealers do the best job. 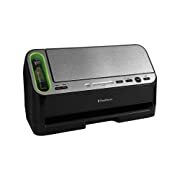 The KEY problem when using plastic bags on your vacuum sealer is that the more common countertop vacuum sealers do not effectively vacuum seal liquids. The tendency is to have the liquid marinade being sucked out. Use an extra long bag to have more space at the top, then put some folded paper towels there to absorb the liquids so it would not be sucked out during vacuum sealing. Marinating food makes it delicious, juicy and for the meat, tender. There are two secrets to it – the recipe for the marinade and the process of marinating. We have provided you with the chef’s secrets on how to portion your acids and seasonings. We have also given tips on what kind of marinade goes best with certain foods. The last and most important secret is on the process. Sadly, using conventional ways, the process can take up to 24 hours to get tender juicy meat. Thanks to the technology of FoodSaver, using their Quick Marinator and their vacuum sealer, the process can be shortened to just 12 minutes. How quick is that! In 12 short minutes, you can get your meat to top condition ready for grilling or cooking.